Easy Marinara Sauce is a dream. No kidding. This recipe is so delicious and so easy. I loved it. 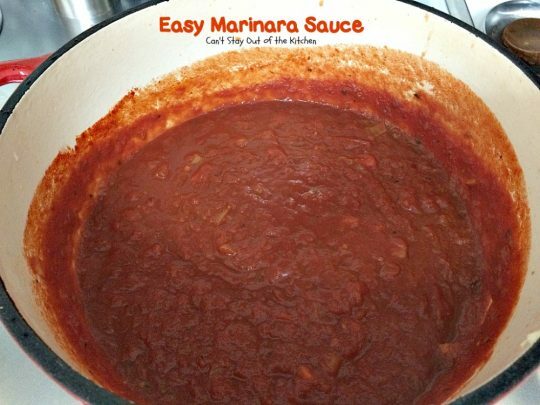 The nice thing about Easy Marinara Sauce is it’s really a great homemade spaghetti sauce recipe for any kind of pizza or pasta dish. 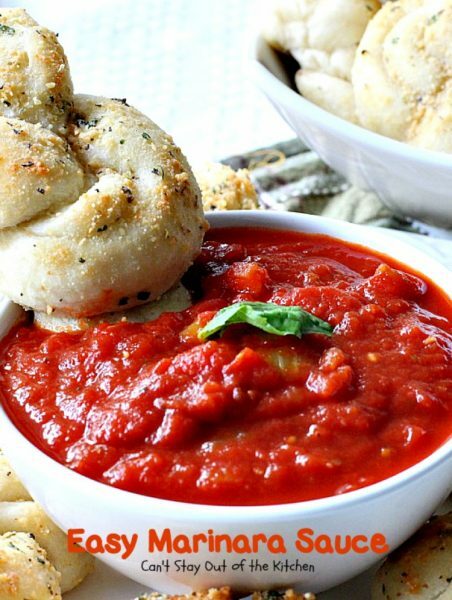 It’s also a wonderful sauce for dipping any kind of Artisan Bread or Easy Garlic Parmesan Knots, like shown in the pictures below. 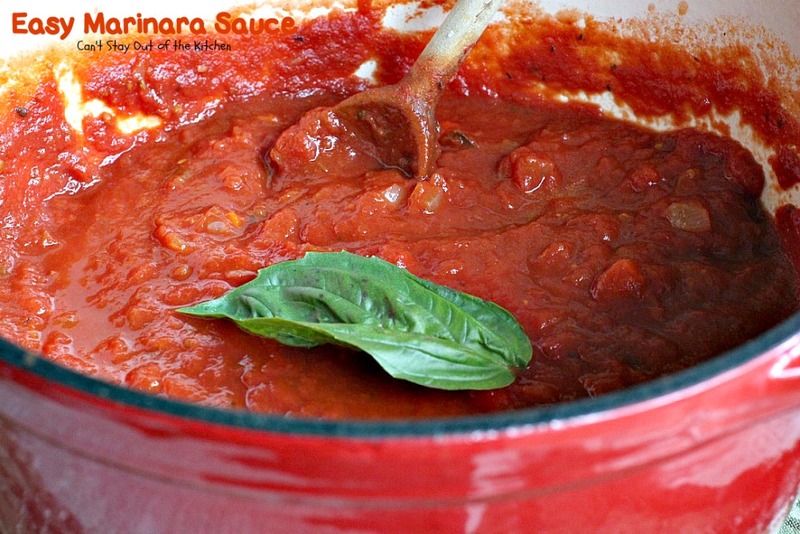 I liked this sauce so much, I’ve decided to incorporate it in many of my Italian recipes in the future! It tastes so wonderful and it really is simple and easy. A few tweaks here or there and you can make many different variations of this spectacular marinara sauce. A couple of weeks ago, I made a meal for a guy and his family who works with John. They moved into our new neighborhood where we’re also building a home. I made them a Pesto Lasagna, Easy Garlic Parmesan Knots (which I served with this savory sauce), Peach and Pear Salad Halves, Monster Cookies for dessert, and Raspberry Lemon Streusel Muffins for breakfast the next day. They were thrilled with all the food and sent me a beautiful flower bouquet the next day. If you’re looking for a zesty marinara sauce to whip up as a dipping sauce for bread, mozzarella sticks, chicken wings or as a sauce for a pasta dish, this is the recipe for you! You will savor every bite and I guarantee you’ll be licking the spoon just like me. 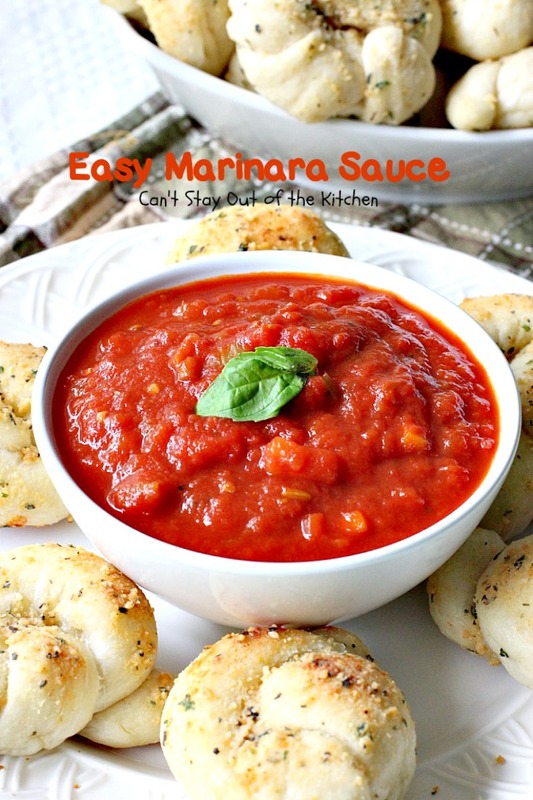 Easy Marinara Sauce is so wonderful you will love it on anything Italian. This is a great spaghetti sauce to use as a dipping sauce for breads, mozzarella sticks, chicken nuggets or wings or Italian egg rolls. I kept licking the spoon as I was making this delectable sauce. The Garlic Knots tasted spectacular with it too. Heat olive oil in Dutch oven. Add onion and garlic and saute 3-5 minutes. Add carrots and celery and cook an additional 10 minutes or until veggies are tender. Add crushed tomatoes and seasonings. Simmer 30 minutes. Remove bay leaves. Check seasonings. Add additional salt, pepper or seasonings if desired. 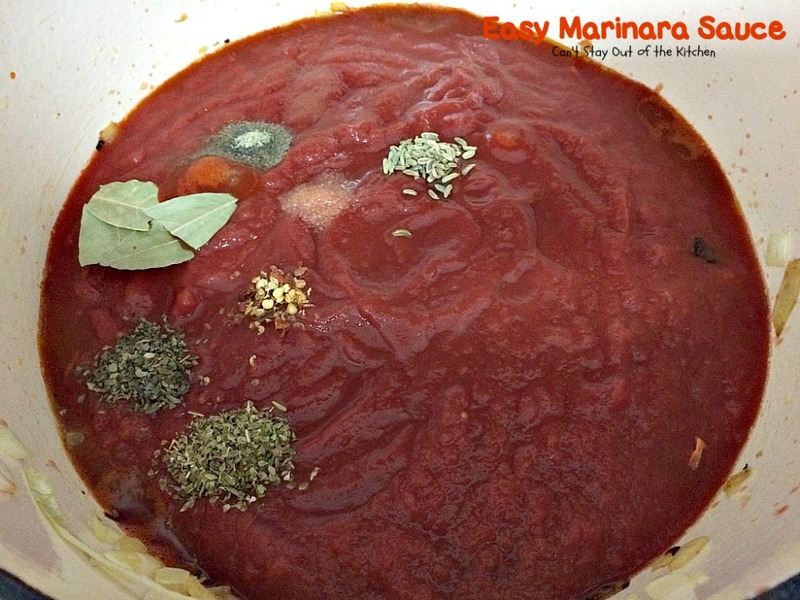 Easy Marinara Sauce is an excellent sauce to use for homemade pizza. This sauce will have you drooling! 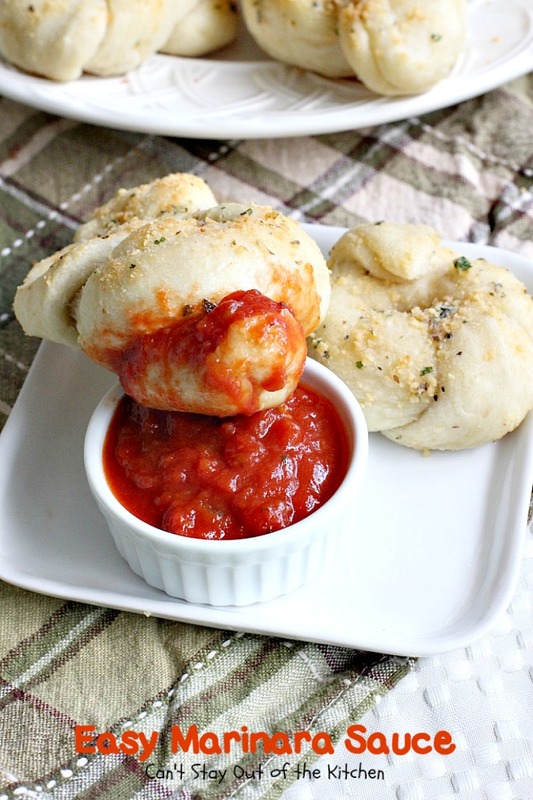 I served Easy Marinara Sauce with Easy Garlic Parmesan Knots. Both were spectacular. 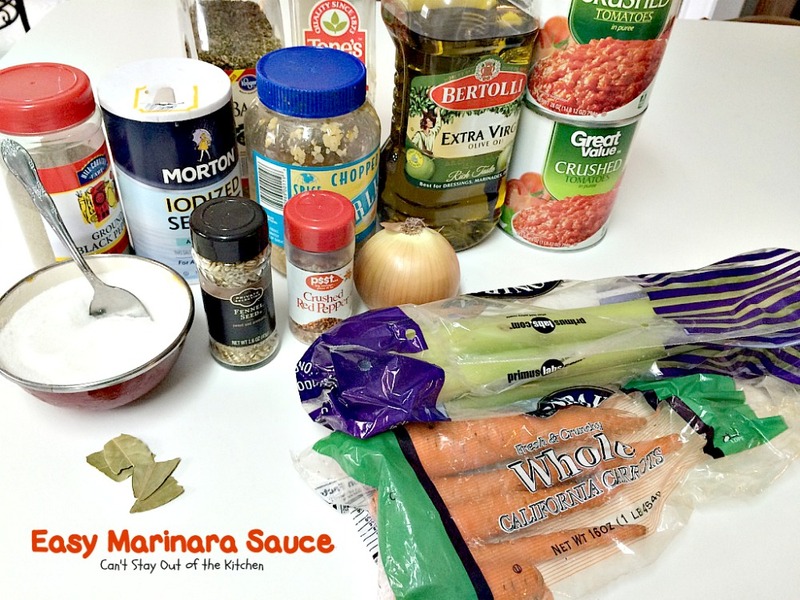 I can’t wait to make Easy Marinara Sauce with spaghetti or fettuccine. 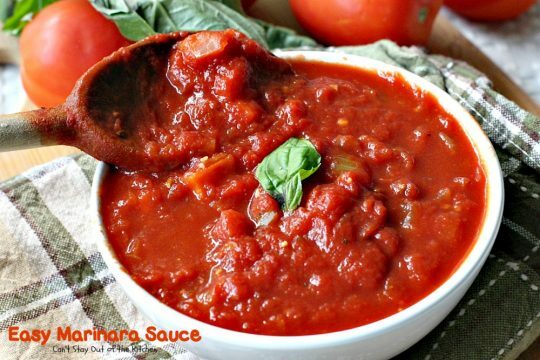 This amazing marinara sauce is great to serve with garlic bread, on homemade pizza or with your favorite pasta. It's quick, easy, delicious and gluten free. In a large Dutch oven over medium to medium-high heat add olive oil and heat through. Add onion and garlic and sauté about 3-5 minutes or until onion is translucent. 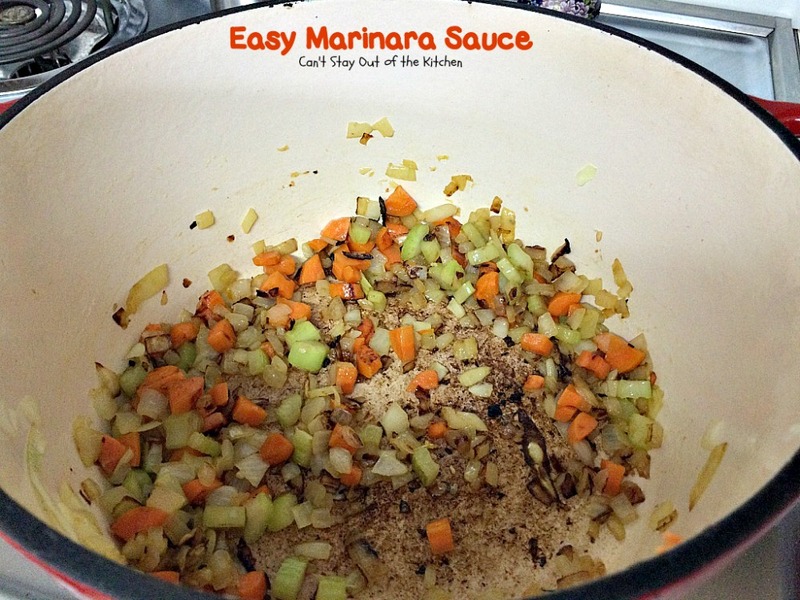 Add carrots and celery and continue sautéing until veggies are tender, about 10 minutes. Add remaining ingredients and simmer, uncovered, for about 30 minutes. Add additional salt, pepper or seasonings, as desired. 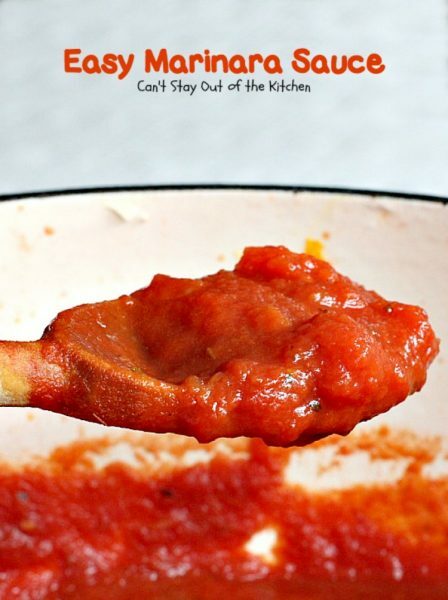 Yield: about 4 cups marinara sauce. 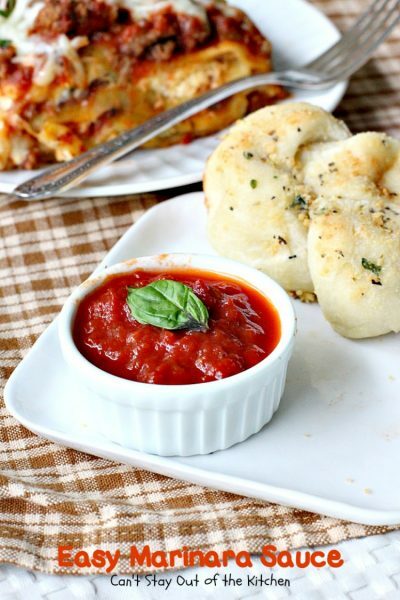 Serve with French bread, garlic sticks, pasta or as a base for pizza. NOTE: The Pioneer Woman adds three tablespoons tomato paste to her recipe to provide a richer flavor, but I found this recipe was sufficient with amped up seasonings. 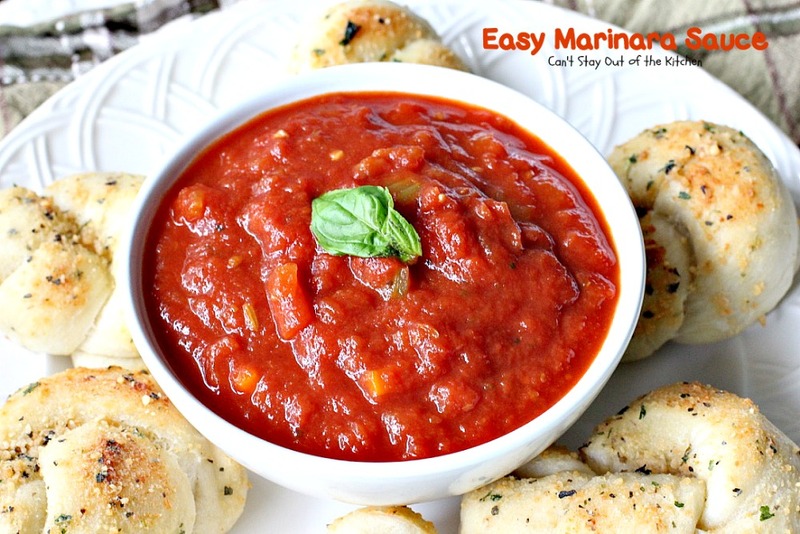 This amazing marinara sauce is great to serve with [url href=”http://cantstayoutofthekitchen.com/2015/12/31/easy-garlic-parmesan-knots/” target=”_blank”]garlic bread[/url], on homemade pizza or with your favorite pasta. It’s quick, easy, delicious and gluten free. The Pioneer Woman adds three tablespoons tomato paste to her recipe to provide a richer flavor, but I found this recipe was sufficient with amped up seasonings. 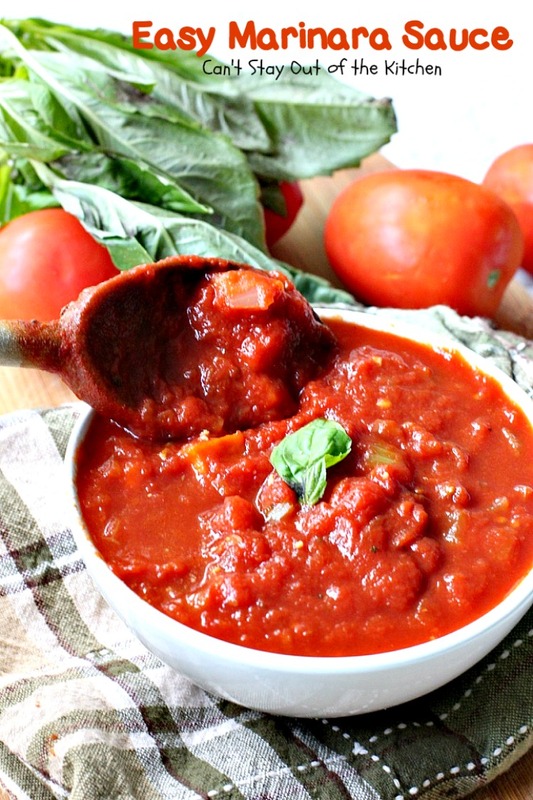 Easy Marinara Sauce is savory, scrumptious and gluten free. Our company loved it. I served Easy Marinara Sauce with Pesto Lasagna and Easy Garlic Parmesan Knots. Yum.